The LTR program was developed at KC Watersports to help wakeboarders learn the basics and progress with other beginners at a slower speed. This program is to create a fun and inviting learning experience specifically for people that haven’t tried to wakeboard, have had difficulty wakeboarding, or would like to learn and progress. 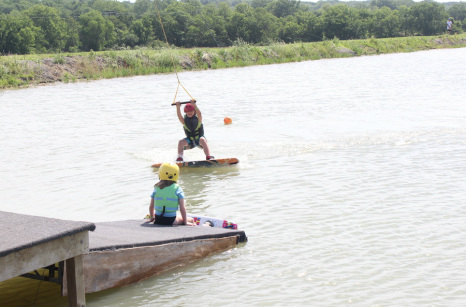 KC Watersports' goal is to develop a larger community of wakeboarders male/female, all ages in the Kansas City Area. Where: KC Watersports 25825 Edgemore Rd. Paola, KS 66071 We utilize both of our cable systems, you decide which one you want to learn on! When: Starting Memorial Day Weekend Through Labor Day Every Saturday & Sunday from 10am - noon. The lesson ends at noon so if you want to take full advantage show up just before 10am. Fill out our online waiver at home to save time! How old? We can teach anyone 7 years to 99 years! I know how to ride can I still come? - We strongly ask that if you know how to ride that you give this time for beginners to learn. Check out our day camps or lessons if you want to keep improving your skills!